Location: Hotel complex Boliarska Kashta is situated in the centre of the famous for its history and culture village of Arbanassi. The building is built in the traditional local architectural styl. 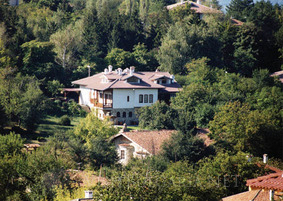 It is located in the park area of one of the oldest churches in Arbanassi, the St. Dimitar's from 17c. Accommodation: Each room has massive wood furniture, private bathroom, mini bar, air conditioner, and cable TV. The hotel offers room service, dry cleaning, safety deposit box at the reception. Wine & Dine: The restaurant (70 seats) offers a rich menu of national and European cuisine, delicious meals prepared by traditional Bulgarian recipes, and a rich collection of branded and specially selected wines and brandies. Folklore programs and wine tasting at the region of Veliko Tarnovo are organized at guests' request. Horseback riding tourism, bicycle tours, sightseeing tours - tours around the town of Veliko Tarnovo and the village of Arbanassi, visiting the "Sound and Lights" Spectacle on the hill of Tzarevetz, tours and walks to the monasteries in the vicinity are also organized. Entertainment: You can enjoy the fresh air and the great panorama at the summer-garden restaurant part of the hotel complex Boliarska Kashta. At the barbecue are prepared meat specialties and grilled "cheverme". The vegetables are organic and are produced for the restaurant. The nice atmosphere is completed by a children's playground, water cascade, and day bar (45 seats). Right next to the summer garden of hotel complex Boliarska Kashta is the swimming complex of Arbanassi, there are a tennis court 100 m away and a horse riding base at a distance of 1km. The hotel complex offers tennis lessons with a tennis teacher.